In the 1840s and 1850s Western New York was a very transient community as people, including Poles, would stop in Buffalo before heading out west. One couple, Charles and Elizabeth Barnicki changed that when on February 27 1853, their daughter Katarzyna Barnicki was born, becoming the city’s first native Polish American. With a new child, the shoemaker and his wife decided to stay and with that would establish a whole new Polonia. Living near St. Mary’s German Roman Catholic Church on Broadway these Polish pioneers adapted to their new living situation by placing one foot in the German community, while still following their Polish traditions as best they could. Around the time of Katarzyna’s sixth birthday, the first resident Polish priest of Buffalo moved into the city. A traveling priest from Plock, Poland, Father John Ignatius Zawistowski was stationed at St. Francis Xavier’s during his time in Western New York. While there, he incorporated the parish, added a steeple, and blessed the cemetery. 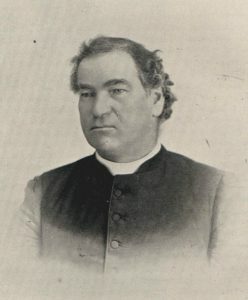 Father Zawistowski would only stay in Buffalo for three years and ended up spending the later years of his life in Wisconsin. As more Poles moved into Buffalo they would also attend St. Mary’s Roman Catholic parish. As their numbers grew they began to overcrowd St. Mary’s and had to stand in the rear of the church. The large group of Poles were soon asked by Father James Nagel of St. Michael’s if they wanted to have a side chapel in the church for Polish Masses. Arranged by the Jesuit Fathers, Jan Arent, a layman, read the gospel in Polish for the services. 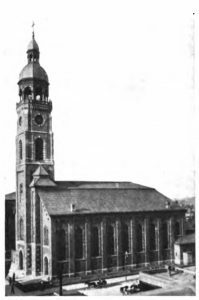 Soon Father J. M. Gartner, the Procurator of the Slavonic Catholic Churches in the United States visited the burgeoning Polonia and on December 12, 1872, helped these parishioners organize themselves into the Society of St. Stanislaus. The single mission of the society was to raise funds to begin a Polish parish of their own. On the other side of the world, a young seminarian named Jan Pitass was attending the Collegium Romanum in Rome. While there, the seminarian ran into Father Gartner who told Pitass of the Society of St. Stanislaus and their desire to establish a Polish church in Buffalo. Pitass was intrigued by the idea and after Gartner gave him a gift $124, Jan boarded a ship and headed off to America. Upon graduation from Niagara University, Pitass was ordained June 7, 1873. The day after arriving in Buffalo, Pitass celebrated Mass with the Society of St. Stanislaus, and formally established St. Stanislaus Bishop & Martyr parish. From the small side chapel in St. Michael’s, Father Pitass went on to establish Polish parishes in Polonias across the Diocese of Buffalo and beyond. In Dunkirk he helped with the formation of St. Hyacinth’s, while in Albion his assistant Father Swinko would oversee Assumption. 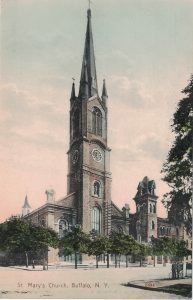 Even in distant Elmira, New York, Father Pitass would be called to create a parish for the Poles of the Chemung Valley which led to the formation of St. Casimir’s Church. "Church Dedicated." Courier & Republic [Buffalo, NY] 26 Jan. 1874: n. pag. Print. Jubilee Notes of St. Francis Xavier Church Fair 1849 1899. Buffalo, NY: n.p., 1899. Print. Kaszubik, Keith. "Buffalo's Polonia Marks 157th Anniversary as North America's Oldest Polish Settlement." The Am-Pol Eagle. N.p., 3 Mar. 2010. Web. 26 Jan. 2016. Krentz, Roger F. Faithful Servants: Pastors of St. John the Baptist Catholic Church, Princeton, Wisconsin. United States: Lulu.com, 2011. Print. 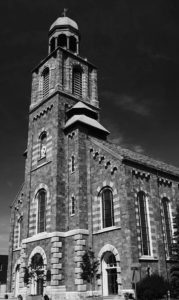 "St. Stanislaus Church." Buffalo Courier [Buffalo, NY] 15 Oct. 1886: n. pag. Print.